The Philanthropy Awareness Initiative was an independent R&D project that ran from 2005 to 2012. Weve kept the website open to provide access to PAI reports and findings. Related work is being done by the Council on Foundations, Regional Associations of Grantmakers, the Communications Network, the Foundation Center, and other philanthropy organizations, as well as countless foundations across the country. Mark Sedway continues to provide influence consulting to foundations, philanthropy associations, and nonprofit organizations. We’re all familiar with that staple of foundation communications—the grant story. Foundation X gives grant of amount Y to organization Z. Can we get beyond this transactional script? Are there new ways of communicating so that the dominant impression of foundations is more likely to be change agent than cash machine? 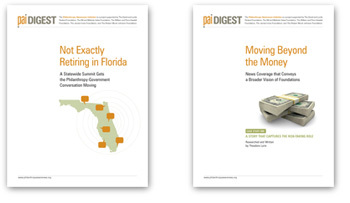 Two new PAI Digests say yes. Moving Beyond the Money, the second in a series by Theodora Lurie, analyzes how one foundation promoted better media coverage of philanthropy through editorial board outreach. Put Your Mouth Where Your Money Is provides a candid and practical point of view from Rich Neimand and Dave Clayton on how foundations can talk about the value they bring society—and in a way that speaks to more than the money they grant. We hear this question a lot when talking with foundation leaders about the challenge of connecting with their counterparts outside philanthropy. Two new PAI Digests provide some answers. Not Exactly Retiring in Florida tells the story of how a statewide summit helped accelerate the conversation between philanthropy and state government leaders. Moving Beyond the Money, the first in a series by Theodora Lurie, analyzes an NPR Morning Edition story that went beyond the typical transactional coverage of foundations. 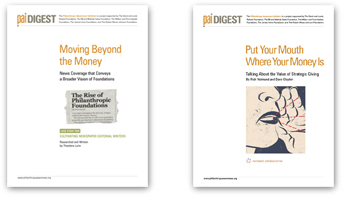 You can look for more PAI Digests this spring and summer. And let us know about other solutions we can highlight. Email Mark Sedway, PAI’s Director, today at mark@philanthropyawareness.org.